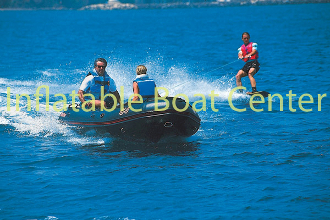 This inflatable boat package comes with a Yamaha F20 outboard and a 6 gallon fuel tank. The Bombard Commando C-4 is the second boat in the Commando lineup, packing in incredible performance and reliability into a small package that will fit into a compact car when broken down and deflated. The performance of an Ultra-R.I.B. with the portability of a special forces strike team. Used by people who spend their lives on the water that demand the very best performance and portability in an inflatable boat. The Bombard Commando C4 inflatable boat, with its heavy duty aluminum floor boards and rigid sectional wooden keel, is a great boat for those looking for the performance of the rigid hull, with the option of portability. These boats are very popular among divers, fishermen, and on the water workers. With its ultimate keel rigidity, this boat will offer better maneuverability and comfort than those with the standard air keel. A great boat with a robust design and the capability to go anywhere! Owning a Bombard Commando C4 means you never have to compromise. R.I.B. Performance, roll up portability. This is Mike's favorite boat and the one he operates here on the Pacific. The "Go anywhere and do anything" capabilities of this boat make it one of our Top Three Picks.